When Liz Miller nominated Bear for the 2017 Cobber Challenge, receiving a general overview of her North Queensland farm as a result of the experience wasn’t part of her thinking. However, thanks to Bear’s extensive travels around her land at Mingela, south-west of Townsville, Liz did in fact end up with what she calls a “vague map” of the area covered. “I didn’t participate in the Cobber Challenge to win it as I doubted my dogs would individually rack up the kilometres to warrant the trophy,” she says. “I just wanted to promote the usefulness of working cattle dogs in this industry and gain recognition for all those graziers who are already using working dogs, at whatever level. “However, the collar did allow me to vaguely map some of the property. I found it an interesting exercise,” she says. 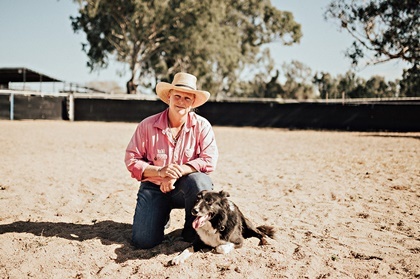 Bear is the star herdsman for 1500 beef cattle on Liz’s 8000-hectare outback spread, where she uses 12 dogs in teams of between three and five at a time. His natural aptitude for working livestock means Bear – described by Liz as “a nonchalant type of dog” – works largely without verbal commands (which are often not reliable in such a tough environment). Instead, he uses instinct and own built-up knowledge to guide his movements. Liz has long been a robust advocate for the need to properly recognise Australia’s working dogs. The Millers’ solution? A team of well-bred pups purchased one by one from expert breeder-trainers and moulded by Liz into a cohesive unit. Liz now breeds, trains and employs her own working dogs such as Bear, an eight-year-old Border Collie, and says she would like to see their invaluable role better understood by the general public. “These dogs are the key thing for our rural industry,” she says. In return for her dogs’ importance both to her personally and to her farm business, Liz makes sure Bear and his canine colleagues “looked after really well”. With temperatures already rising by the time the 2017 Cobber Challenge began at the end of August, Liz was careful to avoid having Bear mirror the intensive working days of dogs in cooler climates further south. He performed impressively despite this, however, ending up seventh overall in the field of 12, having covered 263.7km in 46:49 active hours spread across 21 days.